You need good tyres to drive safely. They affect the steering, braking and acceleration of your car. Classics are more prone to tyre problems than modern cars as many of them are left in storage for long periods of time, and are not used as daily runabouts. This can lead to tyres that are cracked or that have developed flat spots through standing. 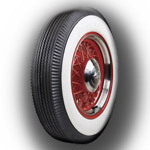 Placing your classic on axle stands when in storage raises the tyres from the ground, removing the load and preventing deformaties and cracking. This will save you money as often classic tyres suffer this type of damage long before they wear out through use. Check your tracking, incorrect tracking will greatly increase the rate of wear on your tyres, as will having tyres that are incorrectly balanced.